The M17 modular pistol, officially adopted by US Armed forces in 2017, as well as its smaller sibling M18 compact pistol, are results of the long and troubled new combat handgun development program, conducted under several names by US military since around 2003. 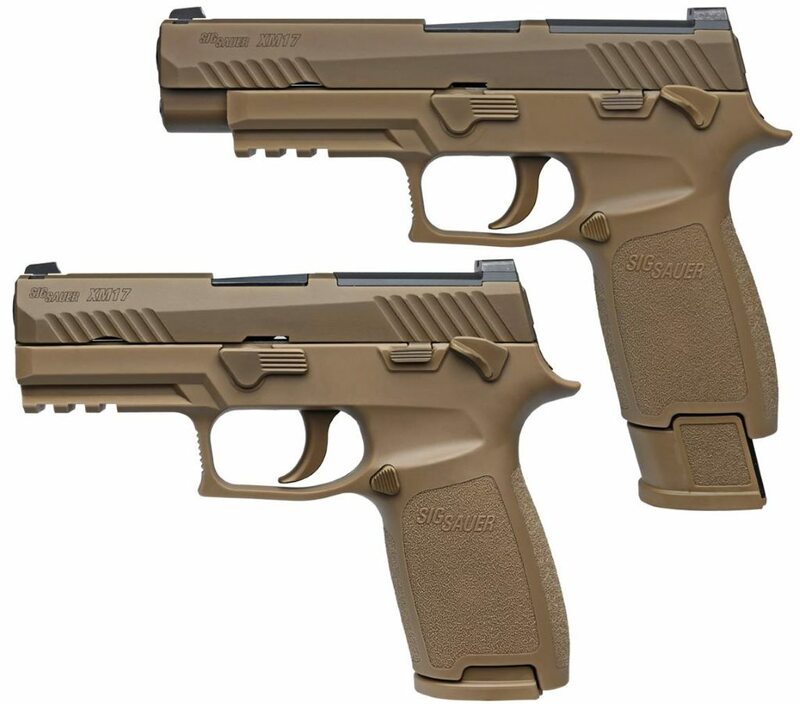 The latest iteration of this program, known as “XM17 Modular Handgun System” or MHS in short, resulted in adoption of the modified SIG-Sauer P320 modular pistol as a future sidearm of US Army and, possibly, other branches of US military. Initial contract calls for 270,000 full size M17 and 7,000 compact M18 handguns for US Army, plus more than 200,000 pistols for other branches. Versions of the M17 and M18 HMS are also offered on the civilian market in USA, for police, security and self-defense uses. M17 and M18 pistols are manufactured by SIG-Sauer factory in NH, USA. M17 pistol is short recoil operated, locked breech handgun that uses cam-operated Browning type locking system. It features compact steel “receiver” that houses trigger unit, slide rails and barrel interface. This receiver, which is a serialized part per US laws, is removably mounted inside a polymer frame. Frames can be had in various colors and sizes, and each M17 pistol is shipped with three frames in S, M and L grip sizes. Compact M18 pistols feature same design and frame, but are fitted with shorter barrels and slides. Pistol features striker-fired trigger system with pre-cocked main spring, and ambidextrous manual safety levers on both sides of the frame. Specific features of this gun, making it different from parent SIG-Sauer P320 design, include anti-tampering pins in the firing unit and on the frame, precluding user-lever complete disassembly (removal of the frame and modular firing unit). Pistols are euipped with three-dot iron sights and have a mounting plate for optional compact red-dot sights. Each pistol is equipped with standard capacity 17-round magazine and two 21-round extended magazines. Optional features include extended threaded barrels which can be used to mount sound suppressors (silencers).